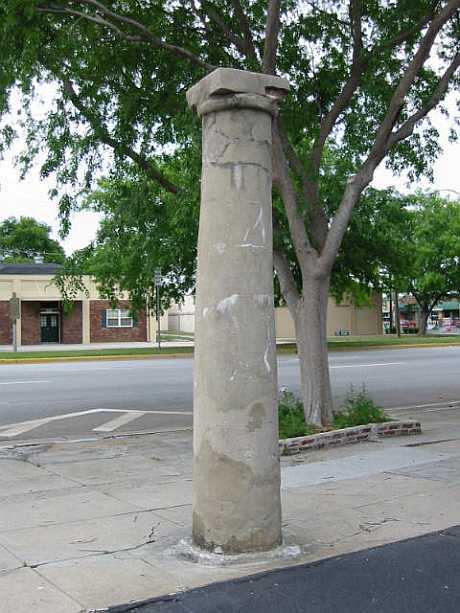 An odd solitary pillar in the Romanesque style is located in the center of downtown Augusta, Georgia. This pillar is connected to a curse that was placed upon the town by a fanatical preacher in 1829. Near where this pillar stands was once the town’s bustling open-air market—known as Lower Market. was to right of this view. One afternoon as the residents bartered for fruit, vegetables and livestock a preacher was tying to make his sermon heard above the din of the shoppers. In one version of this story, it is said a policeman approached this preacher and told him to stop preaching for he was disturbing people. In another version, the preacher became frustrated because no one was listening to him. Regardless, he became so angry he entreated the heavens to curse the town. He shouted that an “ill-wind” would sweep away the marketplace. He told the people who were now paying attention that proof of his prophesy would be one stone pillar would remain standing. He concluded his threat with the statement that if any one touched or tried to remove the pillar they would die. One story states this preacher—an abolitionist-- had come to Augusta to preach against slavery. Forty-nine years later, on February 8, 1878 the preacher’s prophecy came true. A freak winter tornado leveled the Lower Market. Only one pillar was left standing. This pillar was part of a row of columns that held up a portico that was the entrance to the market. 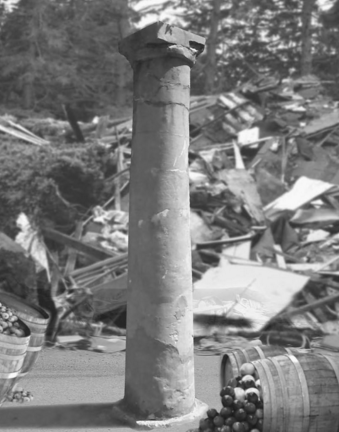 The market was not rebuilt and this lone pillar then oddly stood along a grand boulevard. 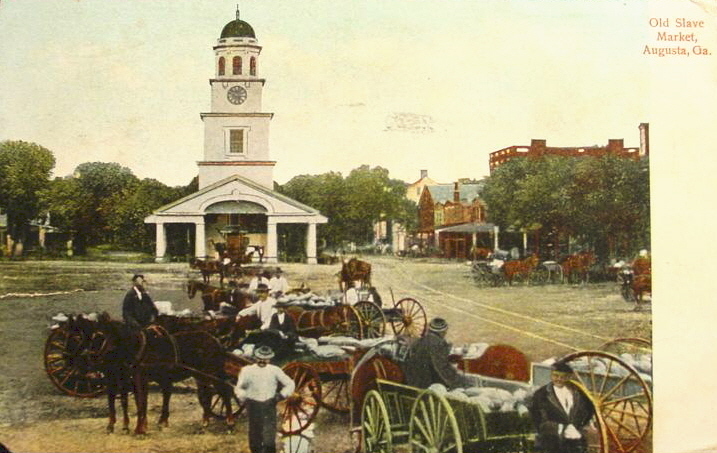 Various attempts to defy the preacher’s warning have become legendary in Augusta for over a century. The first attempt was made right after the 1878 tornado. One man clearing the debris away decided to impress the crowd that was gathered. He tied ropes to the pillar and tried to pull it down. But as he did this he dropped dead of a heart attack. Another legend connected to the pillar states a grocer bought the pillar for $50. He had it moved to Fifth and Broad Streets near his store hoping to attract attention. Shortly after this he died. A few years later as construction was being done on Broad Street, two more men tried to pull the pillar down with ropes. Lightning struck the pillar killing both men. 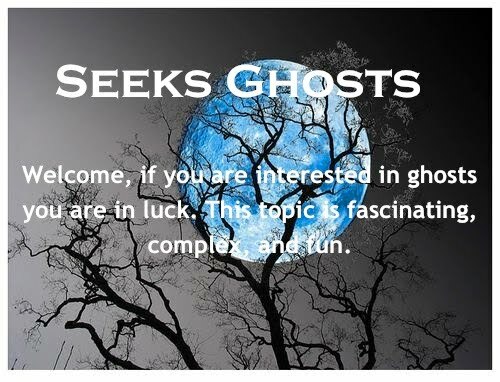 It is also stated curious visitors who have taken chips of the stone pillar away with them have become ill and have had to extend their stays in Augusta. In more recent years, a man driving along Broad Street hit the pillar with his car by accident. Though his car was barely damaged, this driver died at the scene. In 1935, another car hit this pillar—this time the driver survived but the pillar was reduced to a pile of brick and cement—according to the Augusta Chronicle. By this time the pillar and the legends that surround it were viewed with affection so a local market owner had it rebuilt. In 1936, it was moved to the southwest corner of Fifth and Broad Streets—none of the men who moved it suffered from the curse. But this was not the original cursed pillar. On Friday the 13th in June of 1958, a bale of cotton on a passing truck fell off and bumped the column knocking it over. The driver was not injured. After this, the pillar was moved an additional 8 feet from the curb to prevent further accidents.